Not being a Southern girl, persimmons are not in my cooking lexicon. My only experience with them was learning to distinguish between them and tomatoes for a horticulture judging contest in high school. So, when one of our Master Gardeners gave me 2 Fuyu persimmons from her father’s tree in California, it was quite a process to decide what to make! We finally settled on making a salsa to go on top of some pork chops. Alas, I didn’t get a picture of the persimmons before we peeled and quartered them. Aren’t they a nice, bright orange color? 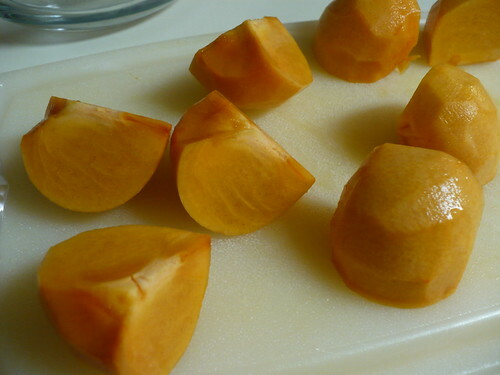 The persimmons were cubed into about 1/2″ pieces. 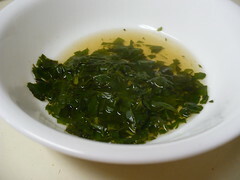 The salsa recipe also called for a tablespoon of minced fresh basil. Yeah, right. I’m not going to buy basil from the grocery store at any time of the year, let alone in December! Luckily, we had the basil that we had preserved at the end of the summer. 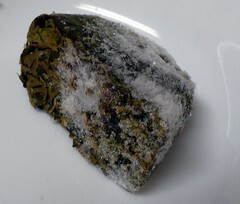 I decided to use one of the frozen-in-water cubes of sweet basil. It was pretty coated in ice crystals, and the top basil was kind of brown and discolored. Doesn’t look too tasty, does it? However, once I melted that ice cube, the basil looks really good! Obviously the water is a little discolored, but the basil itself was a nice green color and fragrant. So, it is good to know that at least one of the basil preservation methods worked pretty well! I’d say that salsa is a good test, because slimy or off-tasting basil would show up pretty clearly. 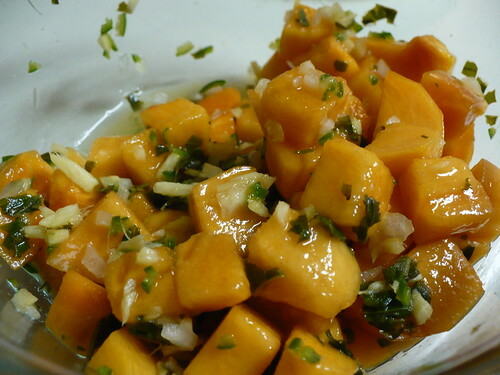 The salsa also had a couple teaspoons of minced fresh ginger, a tablespoon of finely minced onion, 1 serrano (seeded and finely chopped), salt, and pepper. It called for mint too, but we didn’t have any mint. (I think I could have scrounged a couple sprigs out of the Demo Garden, but I forgot about it.) Very simple, but I think it turned out pretty good. Yum! It looks so summery, even though it is December. It was also really tasty on the pork chops. Posted on December 17, 2010, in Harvesting & Eating and tagged cooking, fruit, herbs. Bookmark the permalink. Leave a comment.